Tough Chew Toys For Dogs-Guaranteed! Pawz Waterproof Dog Boots -Tried, Tested, and Loved! Some of the links in this post are affiliate links. This means if you click on the link and purchase the item, I will receive an affiliate commission at no extra cost to you. All opinions remain my own. It’s the start of Fall and that means cooler weather, leaves changing color, and of course Halloween. Many kids put a great amount of thought into their Halloween costume, and can’t wait for the day to arrive. If you are a parent perhaps you will be dressing up too, and if you are a dog owner you will want to include your dog in all the fun. These cute Halloween costumes for dogs will give you some inspiration for coordinating your kids costumes, or your own with that of your dog. With these cute finds your dog may just steal the show! Here are 10 cute costumes that can be found on Etsy. 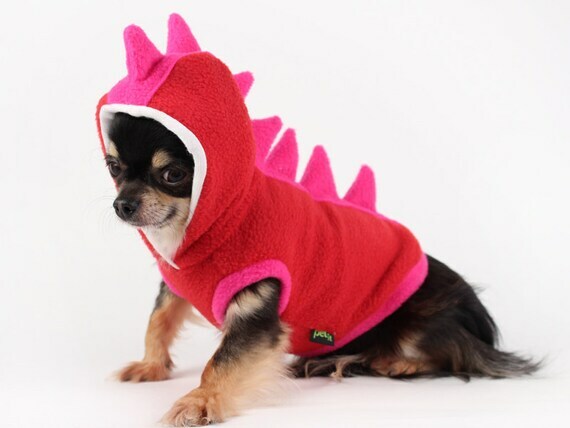 Your dog will look adorable in this spikey dinosaur costume. The bonus is that it will keep your dog warm too, the hoody is polar fleece. Another warm polar fleece hoody that will keep your dog cozy and warm while trick or treating with you. 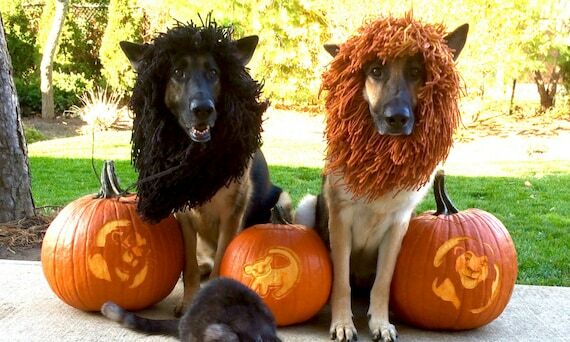 Who could resist dressing their dog up as a lion? 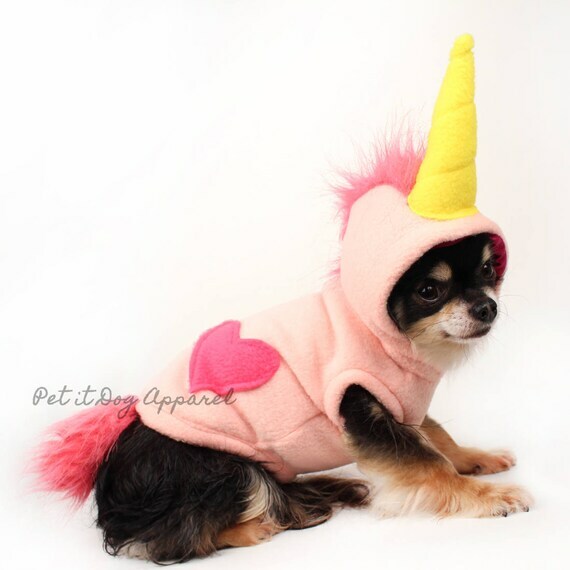 This costume is ideal for the dog that doesn’t want to wear something over their entire body. Make your dog feel like the King in this shaggy mane. You might be thinking of a Lion King themed costume for yourself to coordinate. Superman, or should I say Superdog? 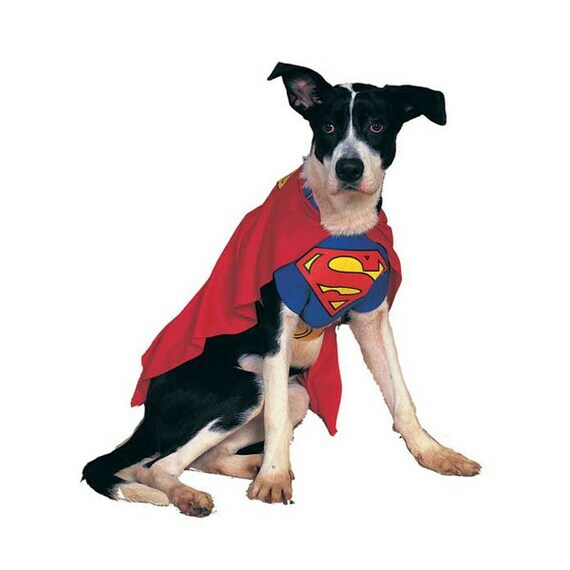 It’s superdog to the rescue, who better to save the day than your furry best friend. Who wouldn’t want to get into trouble from a cute dog dressed like this? 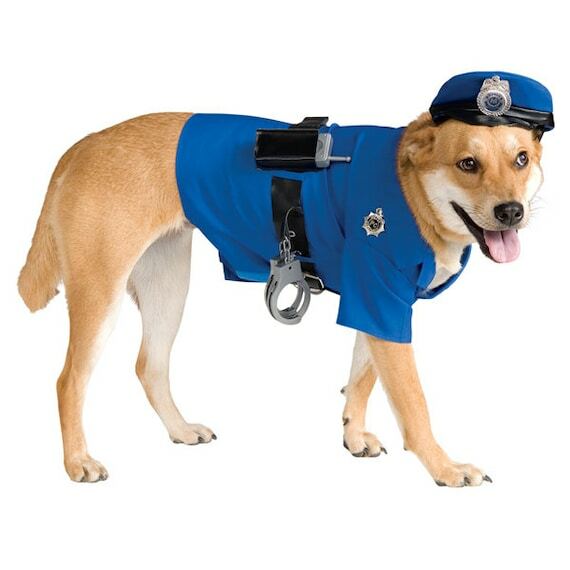 Complete with handcuffs, a walkie-talkie and a hat, your dog will look fierce. Sometimes your dog can be a devil right? 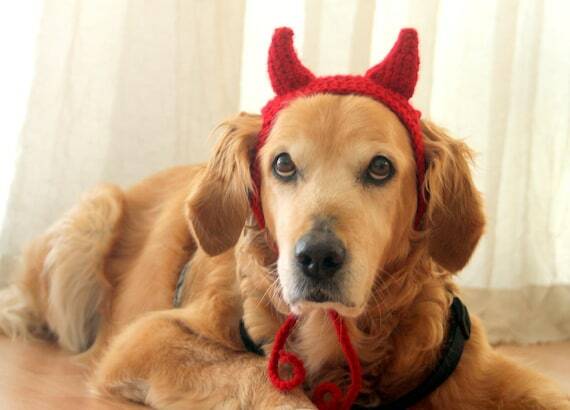 These red devil horns are perfect if you want a simplistic and quick Halloween costume for your dog. 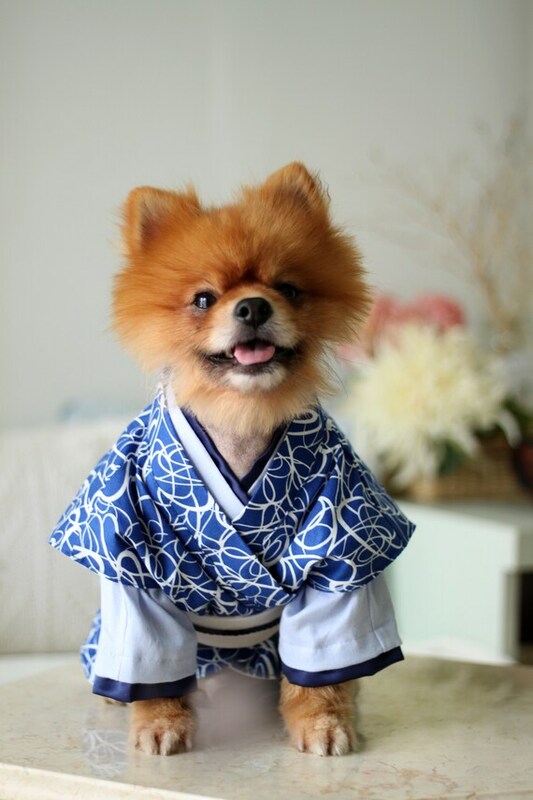 Your dog will look like a Japanese warrior in this cute costume. Perfect for small and large dogs, you could easily coordinate with a karate theme costume for yourself and kids. Dress your dog up as a superhero. 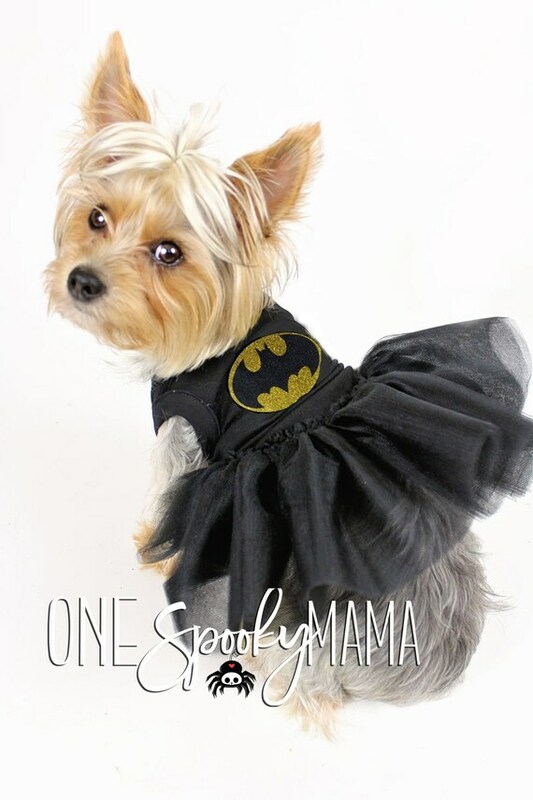 This Batgirl outfit makes an adorable Halloween dog costume. Dress yourself up as Batman and you can be a dynamic duo. Emoji’s are ever so popular right now. Why not put your favorite emoji on your dog. 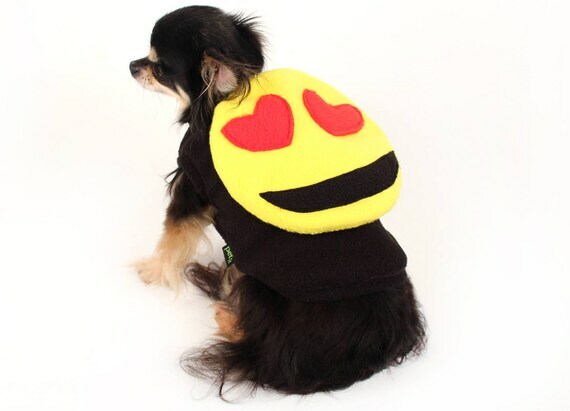 This dog costume can be customized with an emoji of your choice. So funny and adorable. How adorable does this dog look in the picture below? Tinkerbell is everyone’s favorite character from Peter Pan. You could easily have an enchanted evening dressing up as your favorite fairy tale character. I hope you have enjoyed these cute costumes, as much as I have had in choosing them. Always remember to keep your dog safe on Halloween. The costume that you choose for your dog should allow them to comfortably move around, not restrict their breathing or hearing, and should never block their vision. 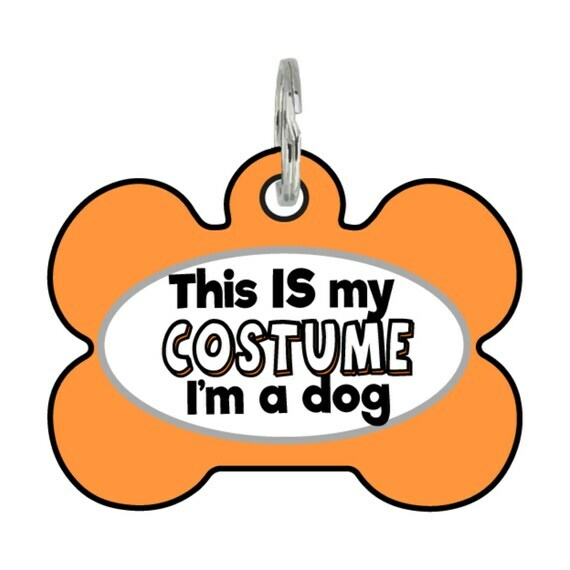 Be careful when choosing a costume for your dog, look for any choking hazards such as buttons, string, or anything that can be a hazard and remove it or avoid it. Always choose a costume that is made specifically for a pet. A costume should never cause stress for a dog. If your dog shows any signs of stress, it is not the right costume for them. Remember that some dogs do not mind being dressed in outfits, while some dogs do not like it at all. You should never force your dog to wear something, no matter how cute and adorable they look. Dressing your dog up in a cute Halloween costume is great if they don’t mind wearing it, but if you have a dog that doesn’t feel comfortable then you can just snap a great photo of them. It is a good idea to do a trial run of your dog in the costume to see how your dog reacts and feels about wearing it, before Halloween. 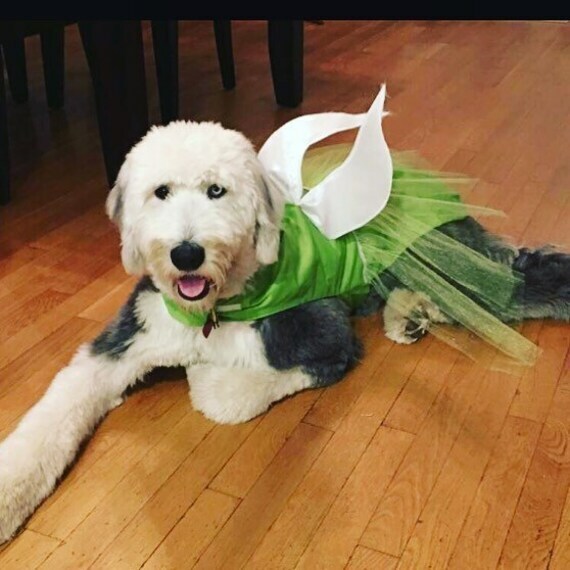 If your dog is outgoing, and happy to go out trick or treating in a costume, remember to monitor your dog at every turn to make sure he/she is comfortable and not stressed. Always keep your dog on leash, and have a current pet ID tag on your dog. 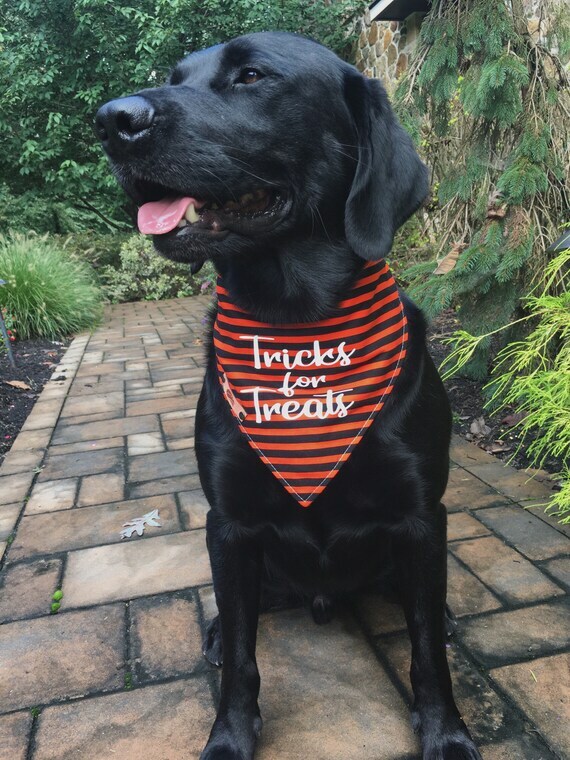 Halloween can be spooky for dogs, even if your dog has a friendly outgoing nature, the noises, costumes, all the people and kids in the dark can be scary for your dog and may cause your dog to run off. Keep a close eye on your dog to make sure he/she does not ingest any Halloween candy or wrappers. Chocolate can be dangerous, and even lethal to dogs, and candies that contain artificial sweetener xylitol, can also be poisonous to dogs. If your dog does not agree with wearing a costume, then you can still include them in all the fun. The following are some great Halloween themed items that can be found on Etsy. Your dog is already in costume, he’s a dog of course. This ID tag is funny and cute. It also glows in the dark, so your dog can be visible at night. Dress your dog in this cute bandana, great as a last minute costume idea, and very minimalistic for a dog that doesn’t like wearing costumes. 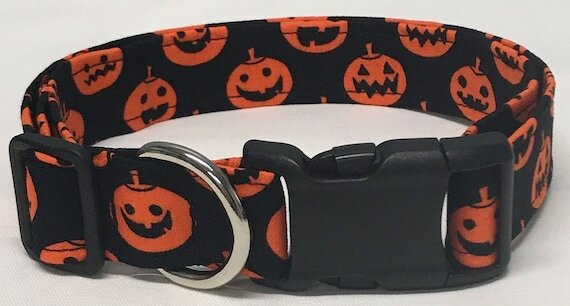 Dress your dog in this cute dog collar with pumpkins all over. Keep your dog safe at night while walking. 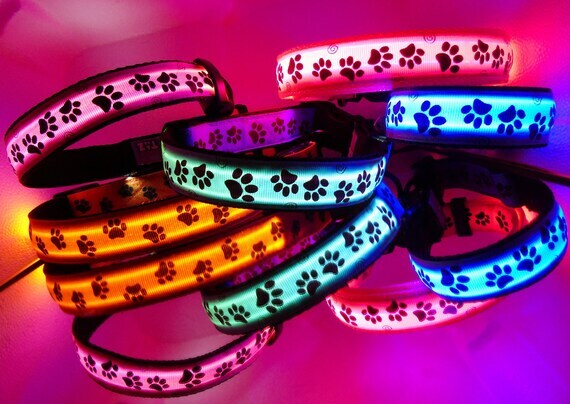 A light up collar is a great idea to make your dog visible to cars driving by, and people walking. If you are feeling inspired and want to purchase any of the items above, simply click on the product title and you will be directed to that product on Etsy. For other items that will inspire you to decorate or dress up for Halloween, be sure to check out the Halloween page on Etsy. Are you planning on dressing your dog up this Halloween? I would love to hear from you. Please leave a comment below, and feel free to include pictures of your dressed up pooch. I am the proud owner of a Golden Retriever named Ellie. She keeps me busy, and when she is resting, you can find me working on my blog. She is always close by though. I live in Peterborough, ON Canada with my husband, and we both enjoy the never a dull moment life with our Ellie. These dogs are so cute and adorable. My favourite one is the samurai dog. I really love her costume and how it fit her. Looking through the post, I think I am going to purchase the karate theme costume for my dog. My dog loves occasions like Halloween and I think she will really enjoy wearing this costume for Halloween. What a fun post to read Jenny. Really loved it. Keep up the hard work. Hi Kuu, I’m so glad you enjoyed this post. My favourite costume is the samurai one too. That dog is just too cute. That’s great that your dog doesn’t mind dressing up, I hope you have a great Halloween. Jenny on Coconut Oil Uses For Dogs-Improve Your Dog’s Health! Firsttimedogmom.com is a participant in the Amazon Services LLC Associates Program, an affiliate advertising program designed to provide a means for sites to earn advertising fees by advertising and linking to Amazon.com and its partner websites.